Evolution Motorsports Supercharger Kit - Stage 2 BMW - Dezod Motorsports Inc - Home of the automotive performance enthusiast since 2002. Evolution Motorsports, VF-Engineering, and GIAC have worked together to create the most powerful and reliable Supercharger systems on the market. The new supercharger systems incorporate the same quality, performance, and attention to detail that all Evolution Motorsports parts do. 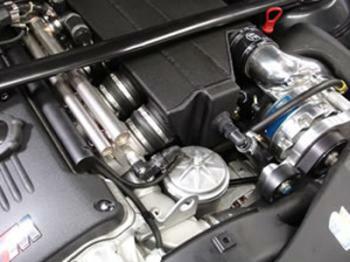 VF-Engineering chose to supercharge vehicles to improve throttle response and mid-to-top end power with the centrifugal Vortech supercharger. Maintaining the the original quality, smoothness and reliability were the key factors in the VF design. This is where the GIAC software comes into full play. VF have harnessed reliability of Vortech superchargers and quality of GIAC custom software with their 10 years of supercharging experience and worldwide OEM supply contacts to create the ultimate supercharger system for the ultimate drivers car. Increased Boost and Performance set the Stage 2 Kit apart from the pack.